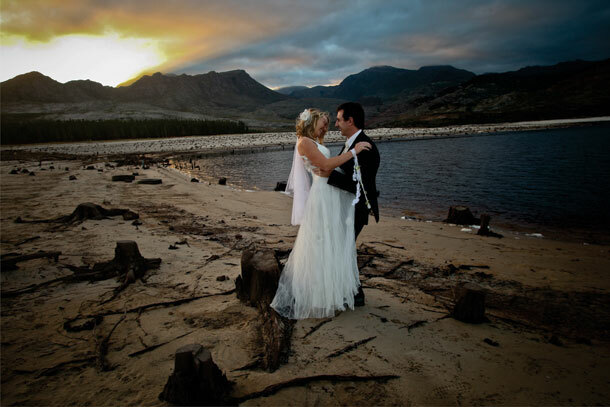 Stephen and Heila Kuhn are the owners of Creative Film Productions House, specializing in Weddings along the Garden Route, Eastern and Western Cape as well as inland in the Klein-Karoo. Weddings have been our passion for the last 20 years. We are accredited members of the Digital Video Association of South Africa for outstanding work. On your wedding day you will be employing experienced professionals that love people and enjoy their work, using the highest quality digital equipment. We use state of the art High Definition 3 CCD digital video cameras. We have different packages that you can choose from. We love weddings. We love the atmosphere of weddings and we put that atmosphere on DVD for you. We love what we do, so would you. We are committed to our brides and grooms. We surpass all expectations in wedding video services because at Creative Film Productions we are not just recording an event, we’re making a movie and we are romantics, specialising in capturing every romantic moment. We believe in a discreet, unobtrusive approach. This means capturing the moments and not the attention. Behind the scenes, about one week of editing go into the creation of your DVD. We use the latest and newest Adobe Premiere Pro editing software on PC with interesting editing possibilities, creating different moods on the DVD. You will watch your DVD repeatedly without getting tired, because of our interesting editing techniques. When the wedding is all over, you can linger over all the delightful moments, marvel at the things which one tends to miss during all the excitement and rewind the good parts as many times as you want. We can provide you with a demo DVD so that you can get an idea of our work or you can go and see some video clips on our website. Storytelling images, creative angles, modern design, contrasting colors, detail, natural moments make our work outstanding. We specialize in wedding videography, so that you can have the best. We believe in a discreet, unobtrusive approach. This means capturing the moments and not the attention. After 20 years doing only weddings, we know how to make your wedding DVD unique and very special because at Creative Film Productions we are all a lot of romantics enjoying being professionals at what we do. To book this fabulous team telephone Heila on +27 (0)44 873-3947. Alternatively for further details or to send an enquiry visit Creative Film Productions.